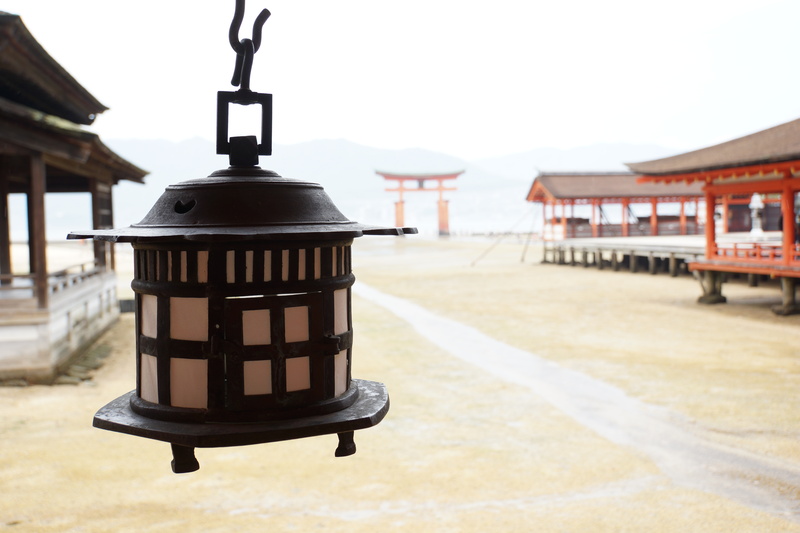 During our last week in Japan, we had the opportunity to visit the Hiroshima Peace Memorial Museum and Itsukushima Island, or as it’s more commonly known, Miyajima Island. We arrived on Miyajima Island by ferry around 10:00 AM to begin our full day adventure in Hiroshima. 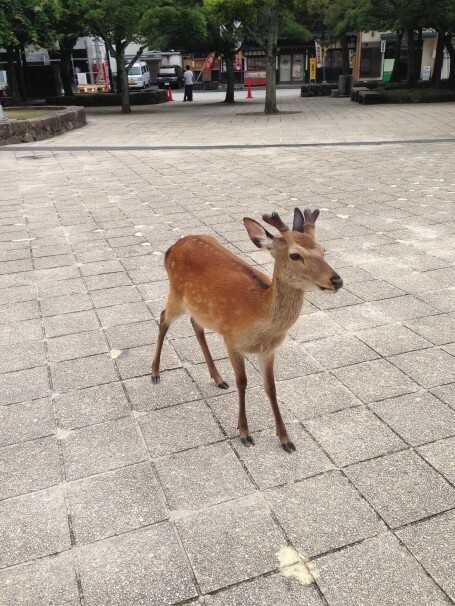 Similar to our experience in Nara, we were greeted by the wild deer that walk freely on Miyajima Island. Although the weather was hot and humid, we were lucky to avoid the typhoon that had been predicted to arrive during our stay in Kyoto. 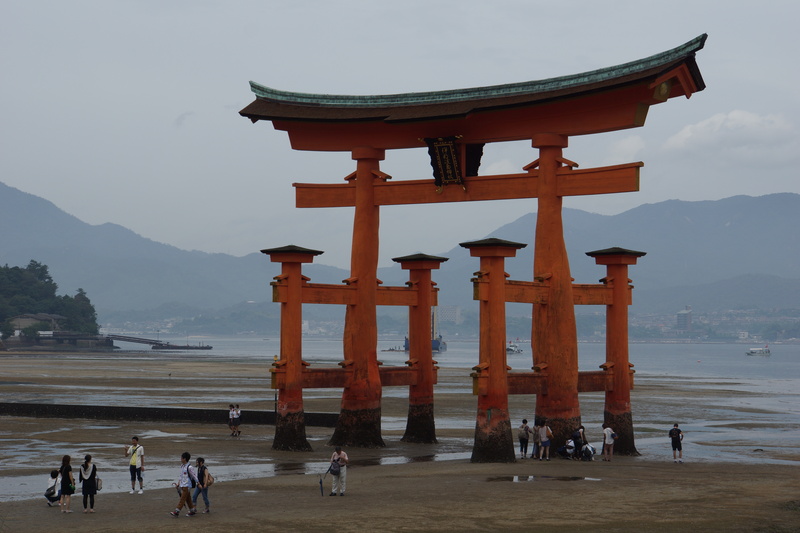 When we visited Itsukushima Shrine, we were lucky to go during low tide, allowing us the opportunity to walk up to the Torii Gate. During high tide, the lower part of the gate is submerged, and it supposedly appears to be floating on water. Itsukushima Shrine is the chief Shinto shrine of Aki Province. Although it was destroyed numerous times in the past few hundred years, the shrine still looks beautiful and astonishing. It is painted in the color orange, which is believed to be able to ward off bad spirits. Therefore, we could see the shrine and the gate clearly even from a distance on the ferry. Miyajima was very unique because the island doesn’t have any natural products that can be readily exported, and therefore the residents make special rice scoops that symbolize good luck. They are not made to be used for actual everyday use, but are rather meant to be used as decorations. After learning about these special rice scoops, we next tried the delicious grilled oysters that are also unique to the island. The oysters are harvested from rafts floating in the bay. Every year, during the second week of February, the island holds a festival where they serve their famous oysters at low prices. If you are ever in the area when this festival is being held, you will definitely have a great time with great food! 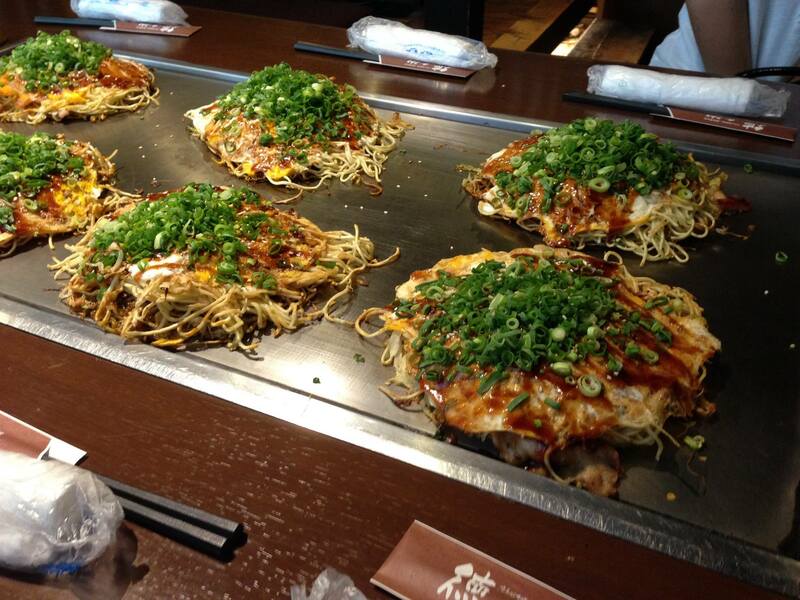 After our visit to Miyajima Island, we went to eat okonomiyaki for lunch. Okonomiyaki is another specialty food in Hiroshima consisting of a savory Japanese pancake that contains a variety of ingredients. Okonomi means “to your liking” and yaki means “grilled,” and thus okonomiyaki is quite literally a pancake that you can grill with the ingredients that you like best! 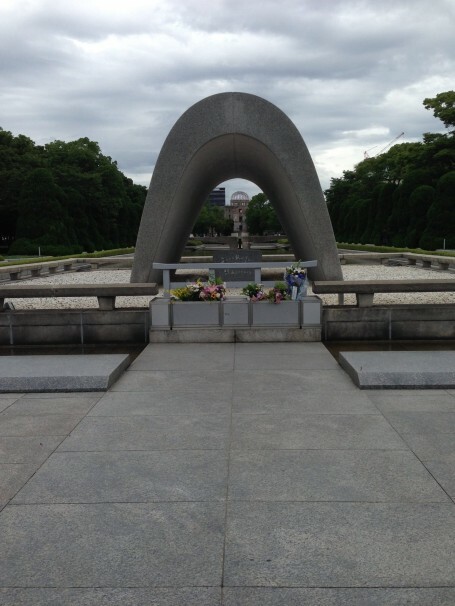 After lunch, we walked to the Hiroshima Peace Memorial Museum. On our way, we stopped by the actual hypocenter of the atomic bomb that was dropped over Hiroshima in 1945. It was surreal standing in the exact location where the atomic bomb was dropped during World War II. After visiting the hypocenter, we went inside the Hiroshima Peace Memorial Museum, where we saw artifacts and remains from the atomic bomb. Rather than condemning the United States for dropping the bomb on Hiroshima, the museum focused on promoting world peace and eliminating the use of nuclear bomb. This was a reflection of the kindness and respectfulness of the Japanese people, and their dedication to those living in Hiroshima. Located outside the museum was a memorial that held all the names of the individuals who were affected by the atomic bomb. Every year they have a ceremony to remember the names of those affected and to be reminded of the peace agreement to never drop another atomic bomb. It was very special to visit the site and to pay respects to those who were affected by this event. Although it is not a time that the United States is proud of, and it destroyed the lives of many citizens, it is important to highlight the event and promote peace rather than war. 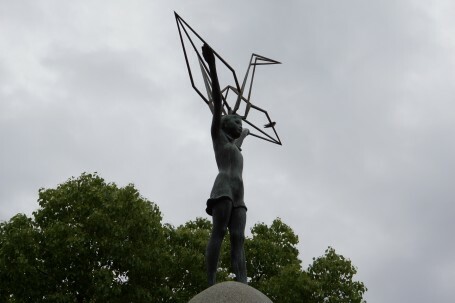 One of the famous figures from the bombing of Hiroshima was a 12-year-old girl named Sadako Sasaki, an innocent victim of the bomb who died of leukemia. 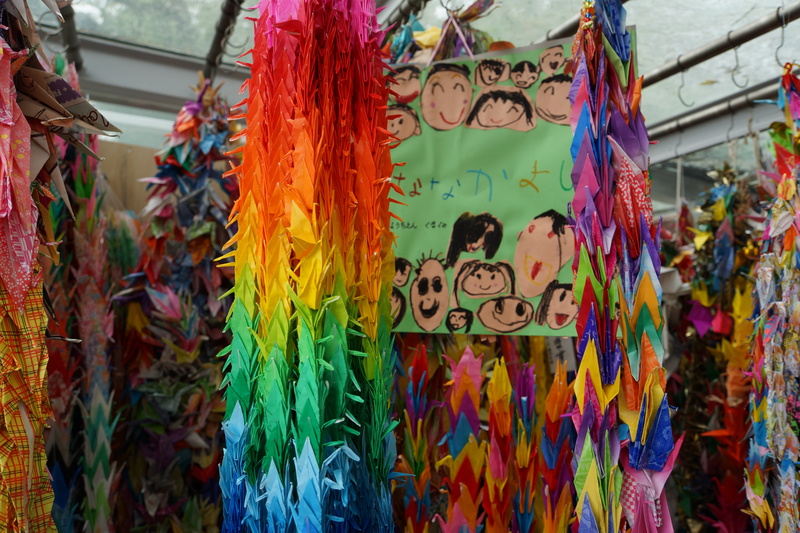 She is remembered through her story of the thousand origami cranes that she folded from her medicine wrappers while battling her illness. There is a memorial dedicated to her near the museum, where people can come and donate cranes. People have come from all over the world to visit this famous landmark, and it continues to bring positive attention to Hiroshima. Some of the students in our group folded approximately 50 paper cranes before arriving in Hiroshima, and then donated them to the memorial when we visited it. It was amazing to visit this famous landmark in person and pay our respects to those affected by the tragic event. After our very busy day in Hiroshima, we rode the shinkansen back to Kyoto, where we would stay for another day before returning to Tokyo. 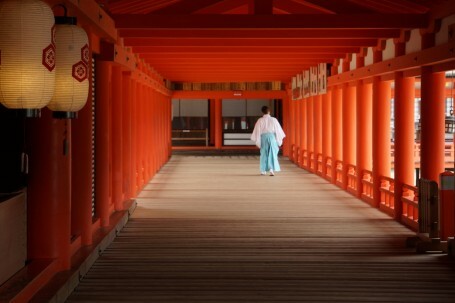 This entry was posted in Kyoto/Hiroshima, Travel by geajapan. Bookmark the permalink.